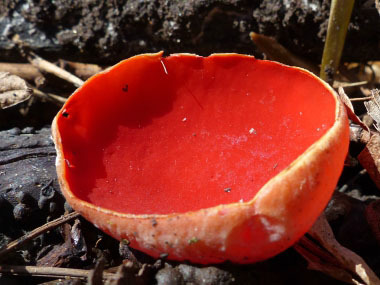 Overview: Scarlet cup is a species of fungus in the family Sarcoscyphaceae of the order Pezizales. There is a similar species, Sacoscypha coccinea; both are edible. This is one of the very few mushrooms that can grow in below freezing conditions. Distinguishing Features: The irregularly shaped cups have a smooth, bright red hymenial (fertile) inner surface and a felted outer surface.The outer (infertile) surface is paler than the inside, sometimes pinkish but often with an ochre tinge. It is covered in tiny hairs. The edges of young cups are often slightly incurved. The cups become wrinkled with maturity, especially near the centre. Height: The overall height of this mushroom is about 3 cm. It has a short stipe or stem, often buried in moss or leaf litter. The stem is the same colour as the outer surface of the cup or somewhat paler. 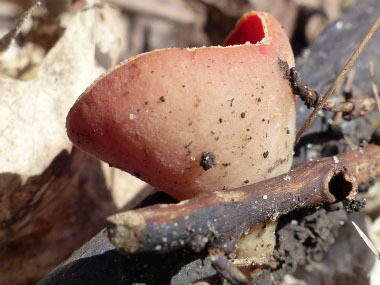 Habitat: Scarlet cups are decomposers of dead wood, particularly hawthorn, beech, hazel, willow and elm. They tend to appear on decaying sticks and branches particularly in damp areas of a woodland floor. 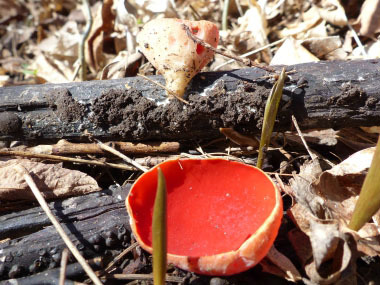 Sarcoscypha austriaca grows primarily on the eastern side of Canada and the U.S. Sacoscypha coccinea grows on the west side of Canada and the U.S. Both species are found in many parts of the world, including Europe, Asia, Africa, South America and Australia. Spore print: White spore print. They make a tiny puffing sound when they release their spores into the air. 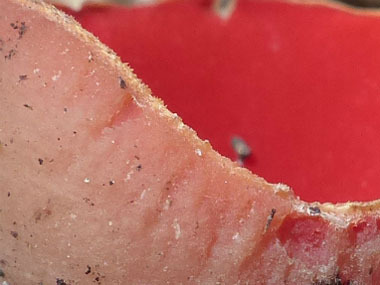 Microscopic tubes called asci release the spores from the upper 'cup' of the mushroom. Season: Late winter into early spring. 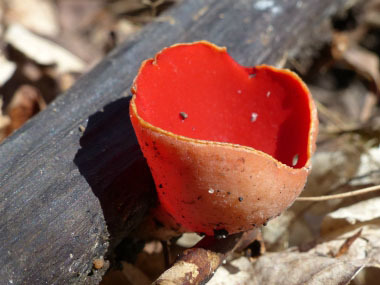 Edibility: Scarlet cups have a subtle earthy and mushroomy flavour with a slightly woody texture. They can be gently pan fried in a little butter or used in a stew. If overcooked, they lose their flavour. In very small quantities, these can be consumed raw.